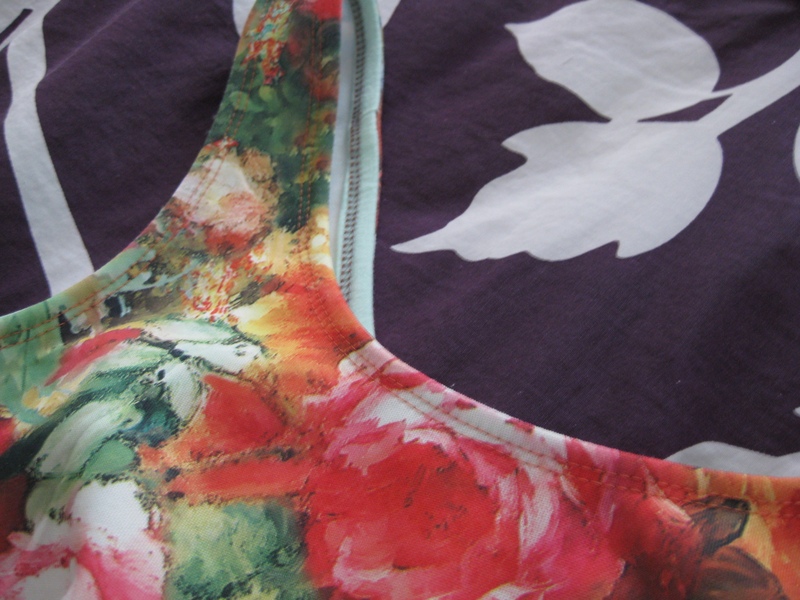 I snagged this digital print neoprene from a local fabric shop for a few dollars a yard. I had no idea what I was going to do with it at the time—impulse buy if there ever was one. Not long after I was digging through my pattern stash and pulled out McCalls 6754. A quick consult on IG as to whether or not it was too loud (haha nobody ever says “no!”) and I was off and running. This pattern was fairly popular a while back, so I had a handful of reviews to check out. Most people gave it the usual “too big” review, and many complained of the straps being too wide set. Usually McCalls has finished measurements on the tissue, but not this one. I didn’t want the bodice to end up too tight (neoprene is stretchy, but not crazy stretchy) so I aimed for about zero ease. My measurements put me in a Medium in the bust, and a Large at the waist/hip. After measuring the pattern pieces, I went with a Small , but added about a half inch to each side seam, and cut a Medium in the skirt. The bodice has a fairly large waist dart, so I reduced the dart, then removed the same amount from the side seam. I should have just done a standard SBA, but I guess I was feeling lazy. To fix the wide strap issue I simply nudged the strap in by a 1/4″, blending into the original neckline and armhole. I also raised the back neckline by 1″, and the front by 1.5″. One inch in the front probably would have been sufficient, but I wanted to keep it at a comfortable height. The back bodice is drafted with a CB seam, but since there was no back shaping I cut it on the fold (same with the skirt). Lastly, I raised the armhole by 3/8″ and blended into the original seam line. I’m not big on the “turn and stitch” method for knit necklines, so I trimmed the seam allowances down to 1/4″, and used strips of knit fabric to do a bias facing type finish. Then, I topstitched all the bindings on my coverstitch. I constructed the bodice on my sewing machine and serged the seams after. Since there is only width-wise stretch, there was no point in using the serger for vertical seams. Plus, I wanted to be able to adjust the side seams if necessary. 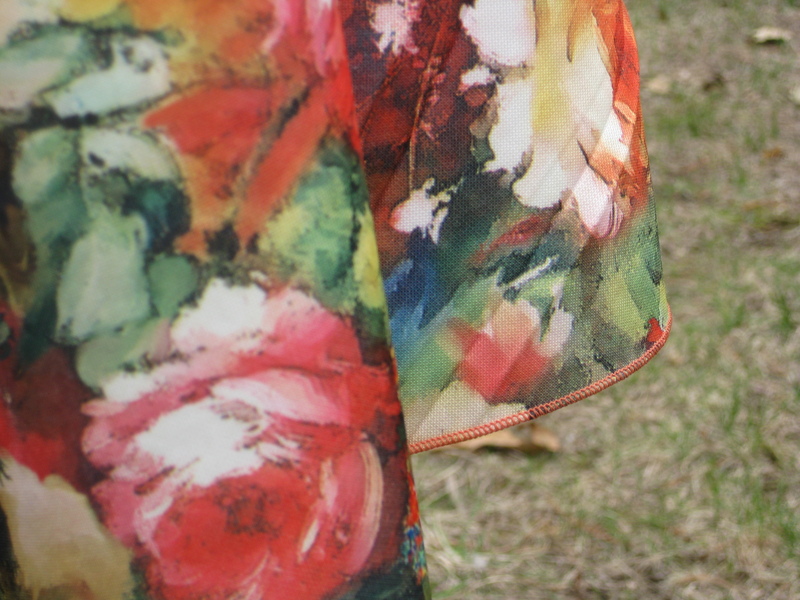 I did use the serger to attach the skirt; there is no zipper in this dress, so I needed to keep the waistline stretchy. I did a simple rolled hem on the serger to finish the hemline. I didn’t see any point in fighting with the fabric and trying to press and top stitch a hem—this stuff can’t hold a crease. (Okay, I say it can’t hold a crease, but after cutting I noticed there were some wrinkles in the fabric I couldn’t press out. Probably why I found it in my discount fabric shop to begin with!) While cutting, I added an extra inch to the length just to be on the safe side. Coupled with my lack of hem, the skirt is basically lengthened by 1 5/8″. I am completely in love with how the dress came out. It’s so bright, and spring-like, and fun! Initially I was worried that the skirt would end up too sticky-outtie in the neoprene, but it ended up with just the perfect amount of body. This pattern is definitely made for heavier knits like ponte, doubleknit, and neoprene. I wouldn’t bother with any fabric lighter than those.